Kishti Villa on Meads East is a spacious and extravagant beachfront property on one of the best beaches in the Caribbean. 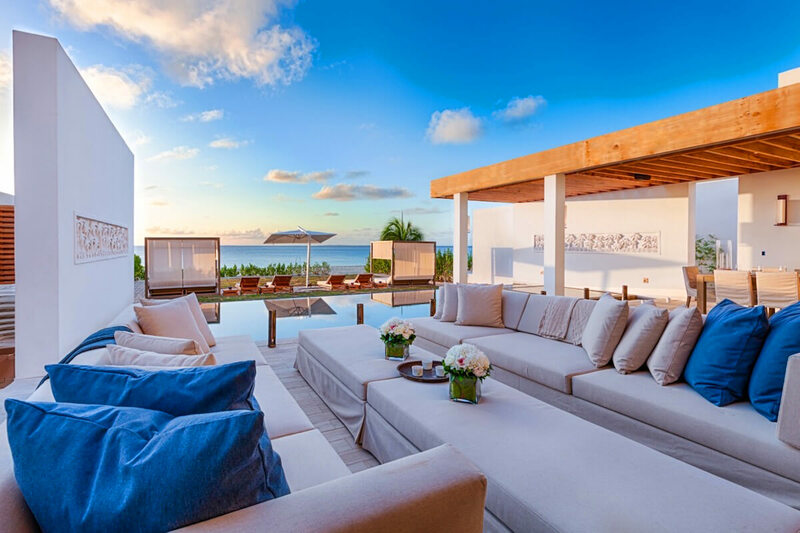 The villa offers plenty of entertainment both inside and out: a home theater, rooftop/patio gardens, beach service, and a gourmet kitchen with a chef. To enjoy stunning Meads Bay Beach, take advantage of the provided snorkeling gear, stand-up paddle boards, kayaks, and children’s water toys. There truly is something for everyone. The staff is all about pampering and includes a chef, a butler, housekeepers, security personnel, a manager and assistant, and concierges who are ready to meet your every need. Kick back with a wide selection of beverages, available at any time, and the villas delicious food services. Or if you like, it’s just a one-minute walk to many local restaurants. Meads Bay is a mile-long beauty with water sports, restaurants, and bars. The beach is a few steps from Kishti’s back door, and there’s stand-up paddle boards and kayaks for exploring the sea. Beach chairs and towels are available, and a row of loungers and daybeds rests between the sand and the villa’s lawn. Kishti’s pool has a plunge area and a Jacuzzi tub partially shaded by an awning. The pool deck has two extra-long sofas and a shaded dining table, so guests can relax outdoors all day. On the roof, there’s more daybeds and a shaded sectional. There’s even a Zen garden for morning meditation. Wall-to-wall sliding glass doors open to the warm, cozy living room and kitchen. A dining table for 12 sits between the kitchen’s chic countertops and the living room’s plush sofas. Guests can watch the flatscreen Apple TV from the living room, dining table, or kitchen. For next-level movie nights, check out the media room’s home theater and wraparound sectional. There’s also board games for simpler entertainment. All six bedrooms have an ensuite bathroom, flatscreen TV, and are exterior access only. There are two suites on each level, so guests have lots of privacy and space. Three suites have king beds, and three suites have two twin beds that can be made into a king. This fully air-conditioned villa also has an alarm system, WiFi, and on-site gym equipment. Welcome drinks and food platter, welcome dinner (holiday and winter only), chef for lunch and dinner in high season, chef for two lunches and two dinners in low season; daily full a la carte breakfast, afternoon refreshments, bath and personal care products, beach service, phone calls to the U.S. and Canada; all house wines/liquors and beer (replenishable by guests); snorkeling gear, and private beach volleyball. Cost of food. Car rental, grocery and beverage shopping (pre-arrival and during your stay), liquor and wine delivery, nanny service, baby equipment, spa services, yoga and personal training, photography, and private airport transfer/car service can be arranged for an additional fee.